AVI Viewer solution provides a structural representation of the AVI container. Supports the original Microsoft AVI format (.avi), ODML, Type 1, Type 2, Matrox AVI defined chunks and DivX file format (.divx). Binary hex view is available along with the chunk tree view. Binary hex data editing of chunk data. Along with the presentation capabilities, the AVIViewer can perform AVI and DivX container validation. 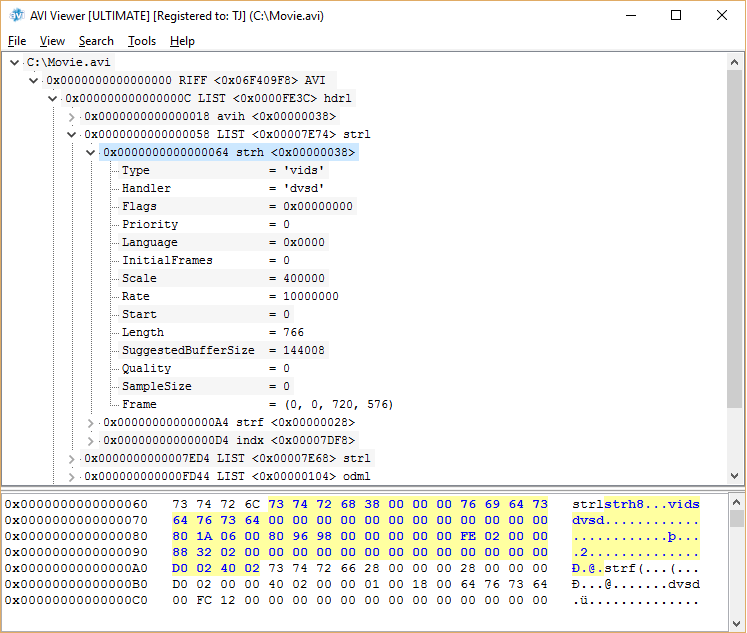 AVI Viewer Pro offers AVI and DivX files verification and validation according to the Microsoft’s AVI format standard. The currently loaded file in the AVI Viewer Pro can be validated by selecting “Validation” from the “Tools” menu. AVI Viewer Ultimate is a product extension of the AVI Viewer Pro. Along with the standard functionality of AVI Viewer Pro, the extended product includes DV, DV 50 and DV 100 video validation, which enables not only the container validation but also the video elementary streams validation in case of DV stream format. The elementary streams validation process is performed by on-the-fly demultiplexing and verification of all audio and video elementary streams subsequently. 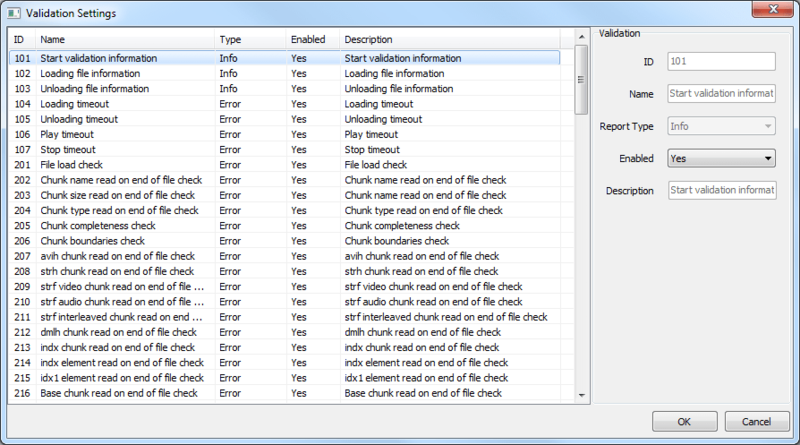 The currently loaded file in the AVI Viewer Ultimate can be validated by selecting “Validation” from the “Tools” menu. Not sure how AVI Viewer can help you? All container errors, such as important AVI chunks absence, incorrect container structure or invalid header values, pointed as mandatory in the corresponding specification are output as Error Report. All container irregularities, which are not pointed as mandatory in the corresponding specification, but have unusual content are output as Warning Reports. Additionally there is a set of Informational Reports, which deliver more detailed information about the file being examined, such as the stream format, media duration, etc. Each AVI container check can be disabled or enabled or set to another report type, such as Info, Warning or Error. The solution can be applied in wide variety of workflows and with many container format deviations due to its flexibility and customization ability. AVI Viewer Pro supports DV 25/50/100 video validation, which is provided as a separate option. For detailed validation check list follow the AVI Viewer documentation.